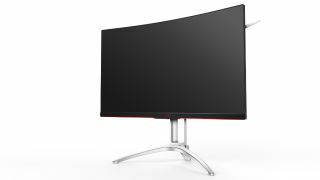 AOC has revealed a pair of new curved gaming monitors which benefit from a ‘three-sides frameless’ design, along with AMD’s FreeSync technology. The two new Agon models are 31.5-inch (AG322QCX) and 27-inch (AG272FCX) in size, with screens that boast a curvature of 1800mm, the most pronounced curve the Agon range has seen yet for the maximum effect in terms of producing an immersive gaming experience. And that immersion is boosted further by the frameless design on three sides – meaning all the edges are extremely thin save for the bottom bezel, as you can see from the image above (note that Phillips revealed a monitor which uses this trick last week, as well). These are 16:9 aspect ratio monitors (not ultra-wide or 21:9, as is often the case with larger curved screens) built with VA panels offering a Full HD (1920 x 1080) resolution in the case of the smaller model, and 2560 x 1440-pixels for the larger 31.5-inch display. Both have a refresh rate of 144Hz, along with a response time of 4ms, and FreeSync tech which eliminates stuttering and tearing for a smoother frame-rate all-round. You also get the usual features AOC has been incorporating into its monitors for a while now: a ‘low input lag mode’ that enables your keyboard/mouse actions to be translated to the screen with minimal delay, and ‘shadow control’ which lightens dark areas, helping you spot snipers lurking in the shadows (without washing out the rest of the image). The monitors also benefit from AOC’s QuickSwitch controller, a nifty little separate keypad for quickly tweaking display settings, along with preset modes for different gaming genres (shooter, racing, RTS and so forth). You also get a carrying handle, headset holder, and LED lights on the lower bezel and rear of the monitor (with three color choices: red, green or blue). Furthermore, an ergonomic stand gives you height, tilt and swivel adjustment. Connectivity comprises of a pair of HDMI ports, a DisplayPort (there are two of these on the larger monitor) and a legacy VGA connector. You also get a pair of USB 3.0 ports. Both the Agon AG322QCX and AG272FCX will be out in May priced at £519 (around $650, AU$840) and £389 (around $485, AU$630) respectively.